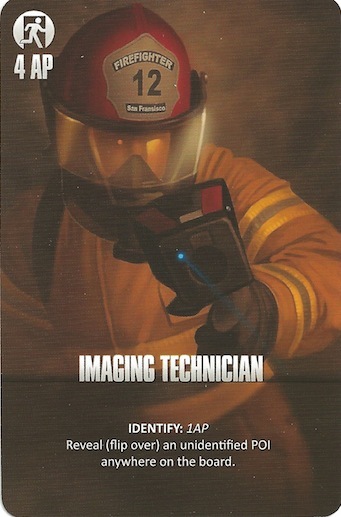 "But, thematically, are there really lots of firefighters sitting around waiting to be tagged in?" I think of it as a gear switch- each role can be carried out by anyone, but they need to get the equipment from the truck. That may not make perfect sense (eg is the generalist not carriyng any gear so he can act faster? they why can't the other specialists drop their gear anywhere but the truck? etc), but it seems thematically better than a bunch of firefighters loitering around the truck waiting for their turn. "I don't know the designer, but I have a hard time imaging him as anything other than a firefighter. The rules are just too specific for me to think he is anything else - I really think that they came from years of dealing with real fires." 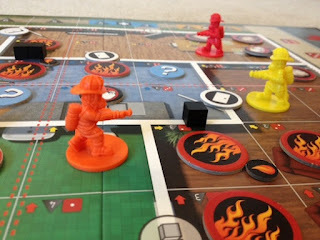 Nope, I'm not a firefighter in real life. Just an enthusiast who did his homework! As far as changing roles goes, firefighters often enter in rotating teams (the buddy system). Periodically teams are cycled with others waiting outside. This could be because the original team has used up their air supply (SCBA, or Self-Contained Breathing Apparatus), it's time to bring in new specialists, they're too fatigued/hot to work effectively any longer, etc. Plus, you wouldn't want to commit all your forces if worst came to worst and your original team became the ones in need of rescue. Managing an air supply didn't make it in the game because it is kind of fiddly and peripheral. Flash Point is actually not a very good simulation of firefighting, but I hope it approximates some of the really important parts, and doesn't suffer too much with gamers for its indulgences. Great review of a great game. And what a thrill to have Mr. Lanzing weigh in. I've taught this game to a number of people and I'm thrilled with how many young ones pick up on it right away and always want to play again. And it works well solo. On my list I'd put this second only behind Pandemic/On the Brink. A lot of people complain about the dice. But that's what random is all about. In most games the randomness is determined by the deck of cards, and then it's not truly random because once a card comes up it's not coming up again. 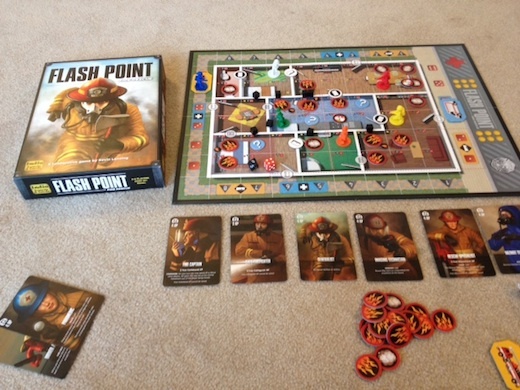 Flash Point can be very easy or very hard based on the dice rolls. That's part of the fun of it.